Are you thinking about living small? A little R and R in a tiny house hotel will let you test drive life in a bitsy abode, ​but you don't need to be a small house fan to enjoy staying in an out of the ordinary teensy retreat. If you're desperate for a mini vacation, the following seven fun-size getaways may be the perfect prescription. Tumbleweed Tiny House Company has been at the forefront of the pint-sized home movement for nearly 20 years. Recently, they unveiled Tiny House Village, an RV resort near Mt. Hood National Forest that's less than an hour's drive southeast of Portland, Oregon. The five tiny houses that make up this teensy hamlet are custom built abodes based on three of Tumbleweed's classic designs: Elm, Cypress, and Linden. Each home is tricked out with all the comforts you would expect in a professionally built house on wheels like fully outfitted kitchens and bathrooms and plenty of small space storage. There's also TV and Wi-Fi for staying connected. Additional amenities include an on-site swimming pool, game room, spa, and biking and hiking trails. The homes range in size from 175 to 260 square feet. The three smallest called Savannah, Atticus and Zoe have room to sleep three people and start at $129 per night. The two larger homes called Lincoln and Scarlett can bunk five folks. Both start at $139 per night. Teensy abodes can make neighborhoods better. 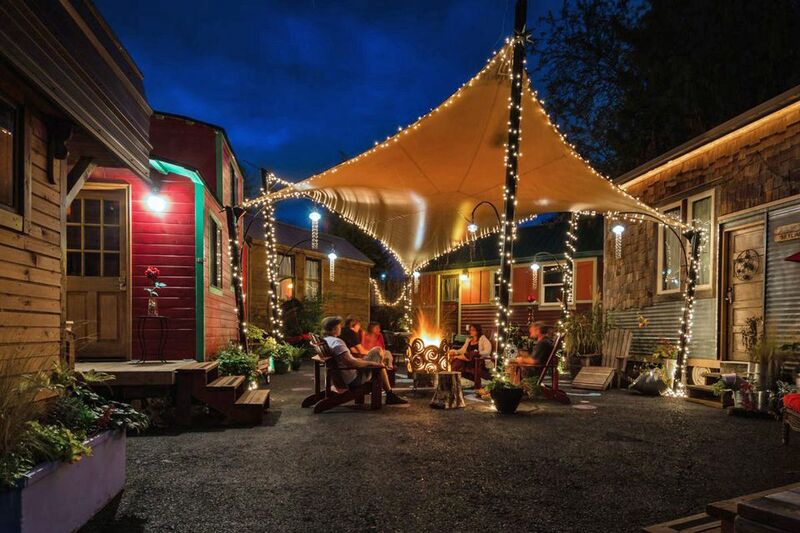 A peachy example is Caravan, America’s first tiny house hotel, located in Portland, Oregon. Before it opened in 2013, it's current location was home to a repo car lot and outdoor hookah bar. It’s no wonder local response to this unique getaway has been overwhelmingly positive. The caravan is smack in the center of the Alberta Arts District, a vibrant area teeming with unique dining options. Guests can experience the downsized life in one of their six custom-built tiny houses on wheels that range in size from 120 to 170 square feet. The abodes are arranged wagon train style around a communal fire pit, which makes Caravan feel more like an urban campsite than a hotel. Tiny houses pop up 24/7 in social media feeds, but in real life, they're rarer than unicorns in the Northeast. Renting a cabin during the summer in a small New England town or Catskills Mountains was a favorite pastime among many city dwellers. A hospitality startup called Getaway is reviving this old-school vacation model using tiny houses. Their goal is to help vacay-starved New Yorkers, and Bostonians get the heck of the city and into the woods. Getaway was launched by Harvard Innovation Lab, a program designed to help any Harvard student grow a gazillion dollar business venture. It has created six tiny house getaways. Their exact locations are undisclosed for privacy's sake, but there are three rentals roughly a two hours drive outside of both New York City and Boston. The minimum stay is one night. Glamping is all about communing with nature without forfeiting amenities like a sushi bar with an ocean view. Yep, that's just one of the little luxuries that come with renting a yurt, aka the original tiny house on wheels, at Treebones Resort, in South Big Sur, California. Each of their cozy yurts features a queen-size bed, electric lighting, and heck yes, a wrap around deck. You can rent a yurt for two or four people with either an ocean or mountain view. Communal restrooms and showers are a short walk away. Additional dining options and spa services are also conveniently located on the premises. Fireside Resort, in Jackson Hole Wyoming, is both a luxury summer and winter ski cabin resort. Accommodations include The Wedge Cabin by Wheelhaus, a luxury tiny house building company. The itty-bitty dwelling features a fully equipped kitchen and a gas fireplace. After a day of white water rafting, you can fire up the propane grill that comes with each rental and afterward hit the pillow on the king-size Tempur-Pedic that you'll find in the bedroom. You can vacation like it's midcentury in a vintage Airstream at Auto Camp in Santa Barbara, California. They’ve been in the RV campsite business continuously since 1922. Would you rather cookout? All units have a spacious and private patio equipped with an electric barbecue grill and two Adirondack lounge chairs. For your cycling pleasure, two beach cruisers are hitched to the RV's rear. Additional amenities include things typically found in high-end hotels like a luxurious pillow-top mattress, spa bathrobes, flat-screen TV and sound system with MP3 input. Another little indulgence is the complimentary bath products by Malin+Goetz. Airstream suites come with an additional treat, a deep soaker tub. You won't have to leave Fido at home because this unique retreat is pet-friendly. Auto Camp recently unveiled their second location in the heart of Sonoma’s Wine country by the Russian River. Unlike their Santa Barbara campsite, all the suites are in brand-new Airstreams. Is your idea of getting away from it all is an island vacation, you can stay in one of these tiny and colorful cottages on Hatteras Island, on North Carolina's Outer Banks. Each charming cottage sleeps four people and is equipped with a kitchen. Communal bathrooms are in a newly renovated bathhouse a short walk away. FYI, no bed linens are provided so you'll need to pack your sheets and blankets. For your cookout convenience, each unit comes with an outdoor charcoal grill and picnic table. Hatteras Island is known for its undeveloped beach wilderness which you can explore with your four-legged friend because yes, pets are allowed.